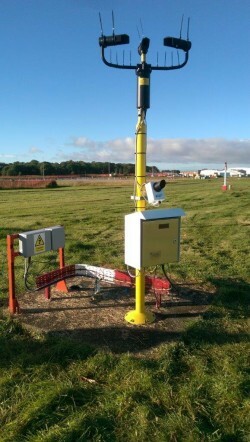 Newcastle International Airport has become the UK’s first airport to use Biral’s advanced forward scatter meter sensors in upgrading its Runway Visual Range (RVR) equipment to achieve Category III runway status. This significant achievement was made by NATS and Aeronautical & General Instruments Limited (AGI), who have since also worked with Manchester Airport to trial the Biral equipment there. Biral’s VPF730 Visibility and Present Weather Sensors are used as part of AGI Ltd’s RVR equipment to offer the airport runways highly-efficient and accurate measurements to eliminate disruption due to bad weather conditions. The system has been successfully trialled at Newcastle International Airport where it was discovered that the technology is able to provide the high levels of accuracy that is demanded by Category III operations. With airport operations rapidly increasing over the years, there are more aircraft travelling throughout the day and night in a range of weather conditions, including severely poor visibility. This has proved to be a major challenge for airports and has caused many delays and less efficient day-to-day operations. As a result, Biral developed the forward scatter meter sensors with the ability to accurately measure the visibility from 10m to 75km to ensure absolute coverage to allow flights to continue until the lowest visibility limits. The system also comprises a unique backscatter receiver, which can intelligently distinguish the difference between frozen and liquid precipitation which is a key factor when determining the safety of aircraft operations. The VPF730 forward scatter meters can be used to replace traditional RVR equipment, such as transmissometers which are extremely large devices and very expensive to operate. In comparison, Biral’s sensors offers significantly reduced system and installation costs to make it easier and more affordable for airports to upgrade to Category III status, whilst offering the accuracy and reliability of the traditional equipment. The use of Biral’s forward scatter meters as a form of a RVR source offers constant results without the need for additional supervision and completely eliminates human error for the most accurate readings. The system is also completely unaffected by interferences such as Obstacle Warning Lights for maximum efficiency. The compact, robust design of the forward scatter meter maintains its reliability even in the most demanding of environments. The sensors are comprised of a single lightweight IP66 rated unit with a hard coat anodised aluminium finish that is highly corrosion resistant, making them suitable for general and offshore aviation applications. Biral manufactures and supplies high specification visibility and present weather sensors designed to suit the needs of users and specifiers. The reliability, durability and accuracy of Biral sensors is reflected in their extensive use in sectors where these qualities are critical. In addition to airport RVR systems, Biral provides sensors used as marine navigational aids, roadside fog warning and to increase sea and air navigational safety. Further information is available from Biral on +44 1275 847787, email: enquiries@biral.com. For further editorial information contact Nathan Neal of Biral on +44 1275 847787, email: enquiries@biral.com or Chloe Walters of Vantage PR on +44 1600 715251, email pr@vantage.uk.com or fax +44 1600 715254.